Today is the last day of #WorldWatercolorMonth, and I am proud to say I was able to post an original watercolor every day this month. 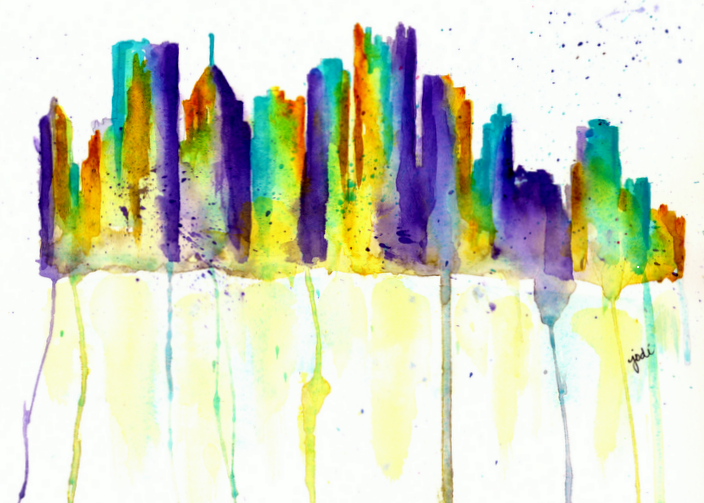 To celebrate the last day, I’ve been itching to do a semi-abstract cityscape, so here is my version of the Pittsburgh Skyline in a rainbow of Cobalt Teal Blue, Winsor Violet and Quinacridone Gold. I have lived in the Pittsburgh, PA area my entire life. Though I have moved from suburb to suburb growing up and then after getting married, I have always loved this beautiful, “most-livable” city. We live in the “country,” but it is only a 30-minute drive to all the wonderful things our city has to offer for arts, entertainment, business, restaurants, sports, rivers, and shopping. In fact, that is just where we went yesterday to look for bridal gowns, and oh what fun we had! Well, we actually passed through town and went to the “South Hills,” but it was a successful venture, and Liz said “Yes!” to the most beautiful dress! I gasped, then I cried. I feel so fortunate that both of my boys have found such wonderful young ladies to share their lives with. Want a sneak peak of the dress????!! You didn’t think I’d actually show you, did you? But it is under there and in the hands of the beautiful, glowing bride-to-be! 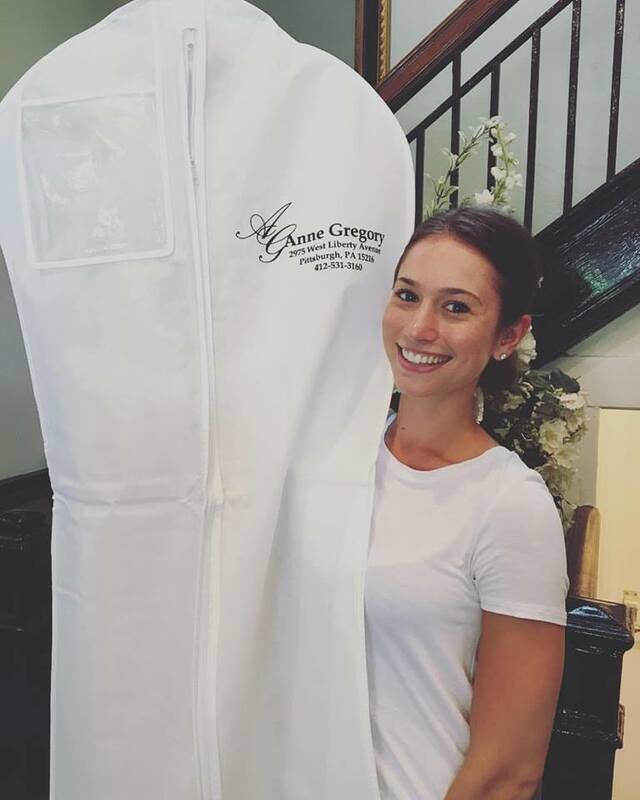 A big thanks to Chelsea and Greg and the wonderful folks at Anne Gregory for the Bride for such an amazing experience, we didn’t have to go anywhere else! More time for toasting champagne and celebrating with Liz and her sisters and mom! Happy Sunday, and happy last day of #WorldWatercolorMonth! I hope you’ve had as much fun as me. (Or maybe you are as relieved as my son Nick that it is over!) Whichever the case, thanks for spending it with me here at lifeinbetween! 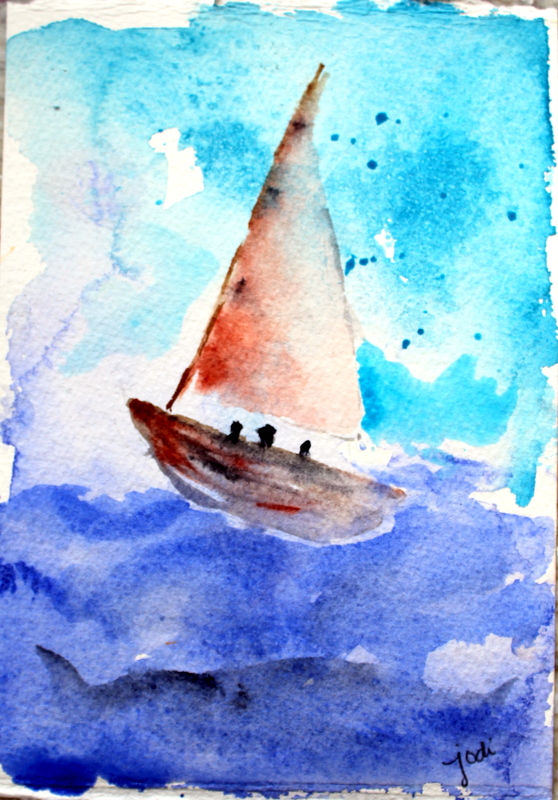 Today’s super quick little watercolors were made the same time as my little sailboat yesterday during my time at Girlfriend Camp (#GFCGeneva2016) this past week. 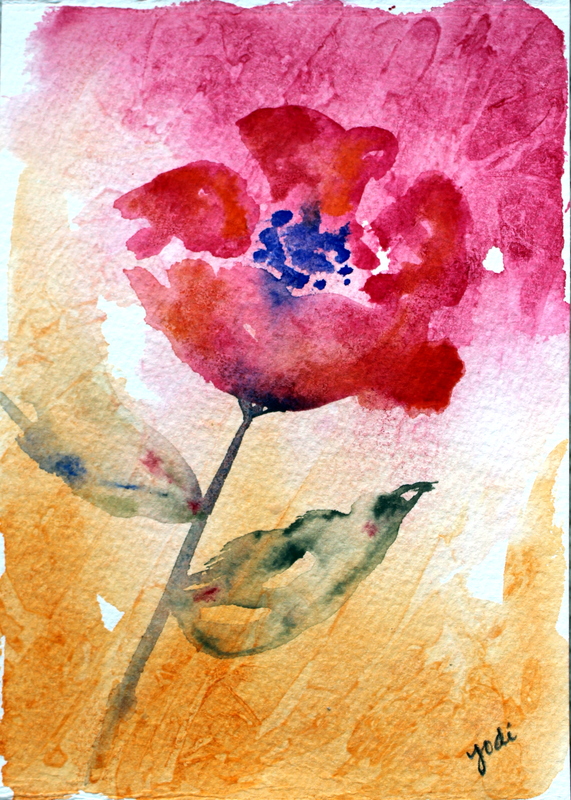 They are really just experiments with colors mingling and using inexpensive Sakura Koi Watercolor Field Travel set (which, by the way have really sold me on the case to buy artist quality watercolors for artist quality results. I’m not very happy with these, but I did have fun playing with limited supplies while away. I really should have left them without painting flowers on top and done something abstract. 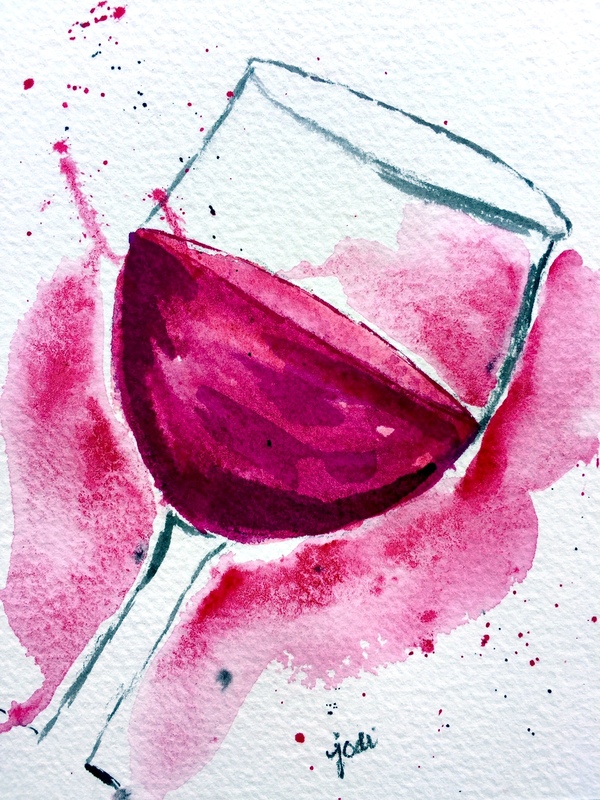 I didn’t want to miss out on a single day of #WorldWatercolorMonth, however, so this is all I have to offer today. I get to go wedding dress shopping with my soon-to-be daughter-in-law and her mom and sisters today! What a great event to come home to! Happy Saturday, and Happy Weekend! 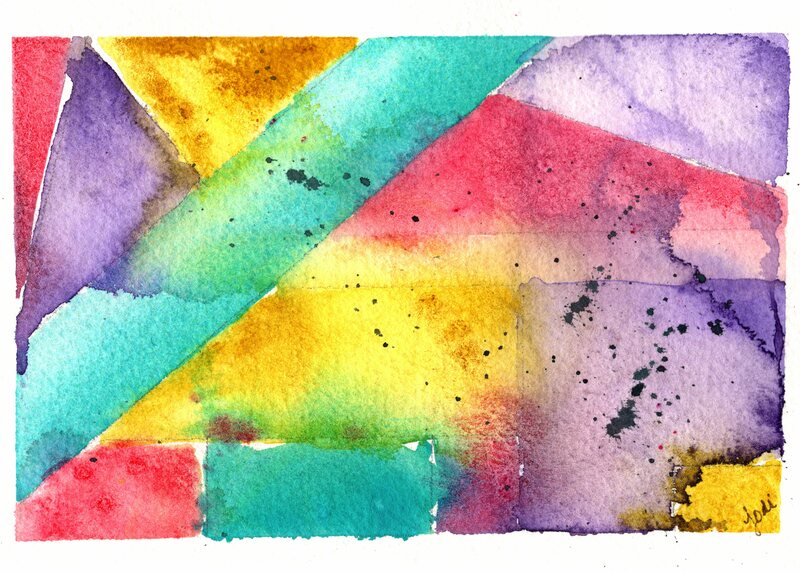 In honor of our last day at Geneva on the Lake for #GFCGeneva2016, my watercolor for #WorldWatercolorMonth is a super quick little sailboat on the lake done with my inexpensive Sakura Koi Watercolor Travel Field Set. I painted a few backgrounds late one night and then added the boat the next day since the random mingling of dark blue and teal reminded me of our beautiful view this past week of the lake. Come sail away with me… to the lake… or the ocean… or the sea. I’m at “Girlfriend Camp” (#GFCGeneva2016) this week. Yesterday we went on a little winery tour. 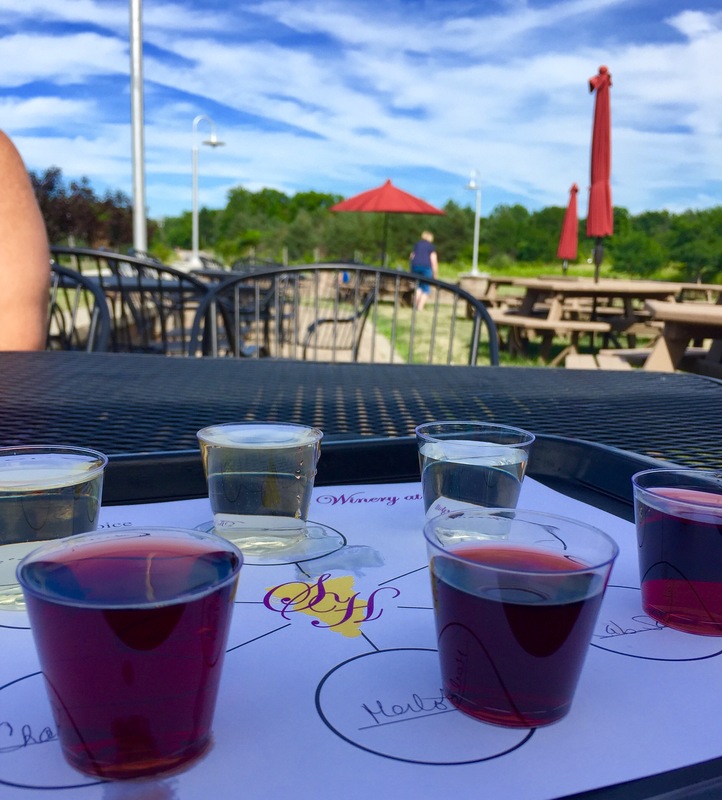 We had some wine flights alfresco at one winery. And guess who had the red one amidst the fruity whites? 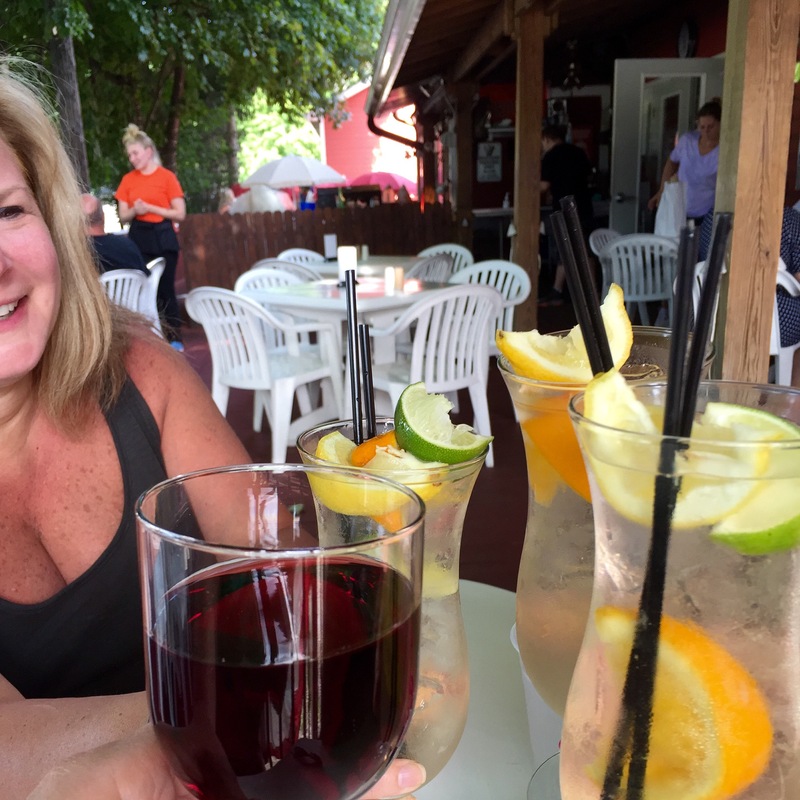 And by the third stop, we were getting our “wine shine” on. 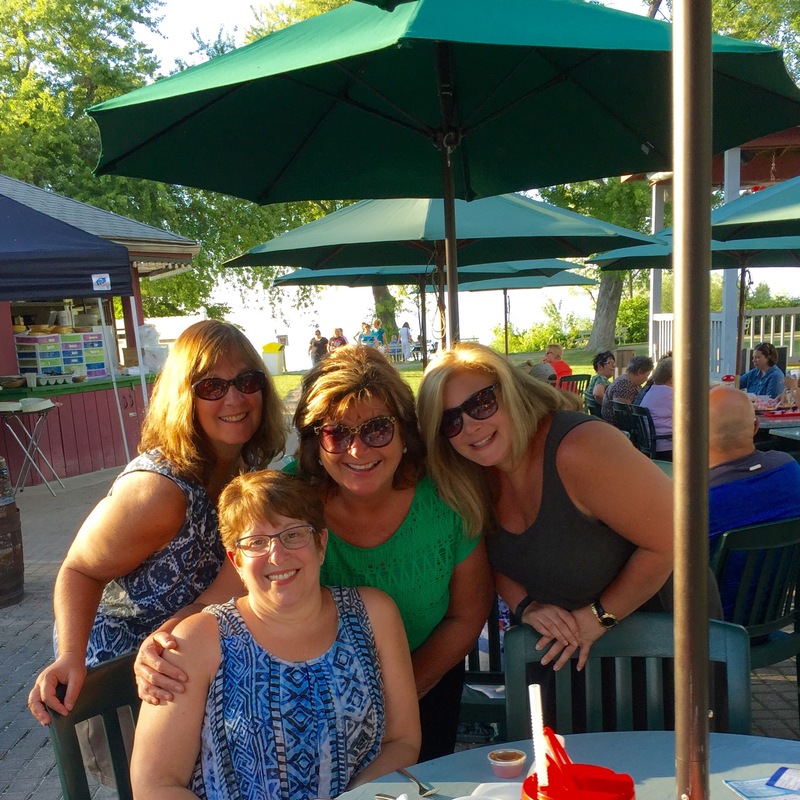 Okay – maybe the guy at the table next to us at the second stop said we were already there at Stop #2…. 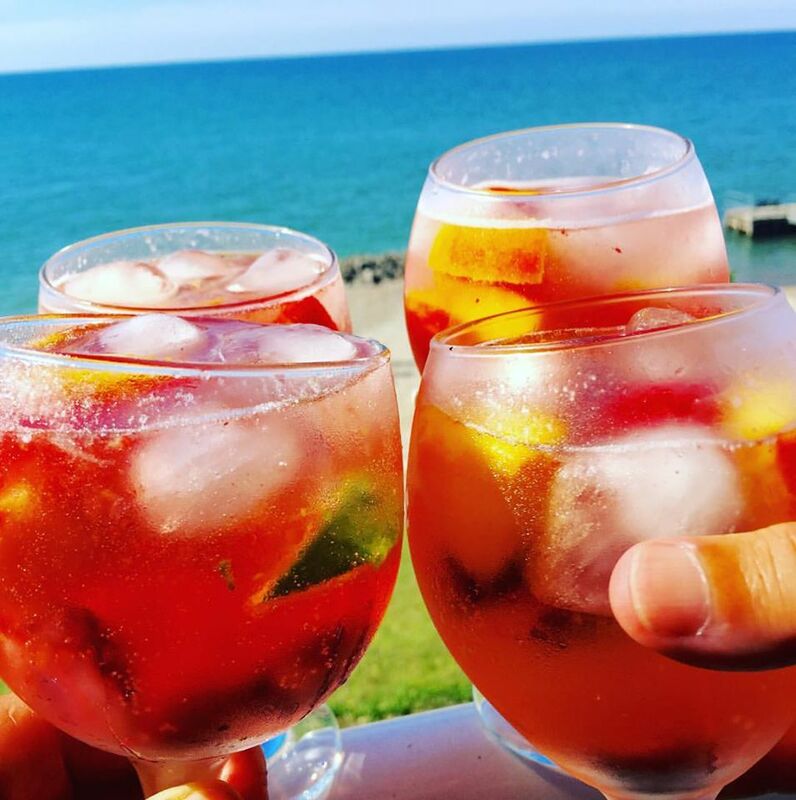 The next evening was Prosecco Sangria on our balcony for happy hour. Which just so happens to be the “ring tone” on Bubby’s cell phone for us three chicas! 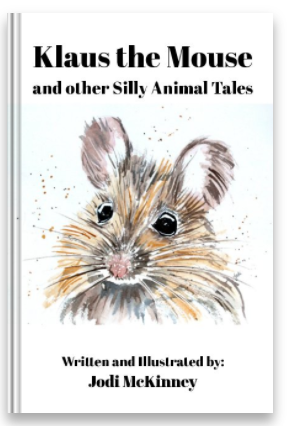 I have begun reading a beautiful book…. It is called “And the Mountains Echoed” by Khaled Hosseini. 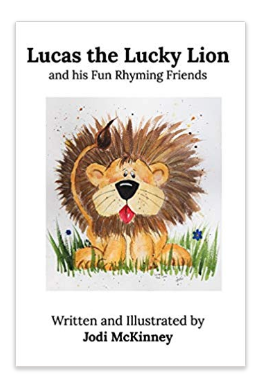 It is a tale exploring the many ways in which families nurture, wound, betray, honor, and sacrifice for one another; and how often we are surprised by the actions of those closest to us, at the times that matter most. 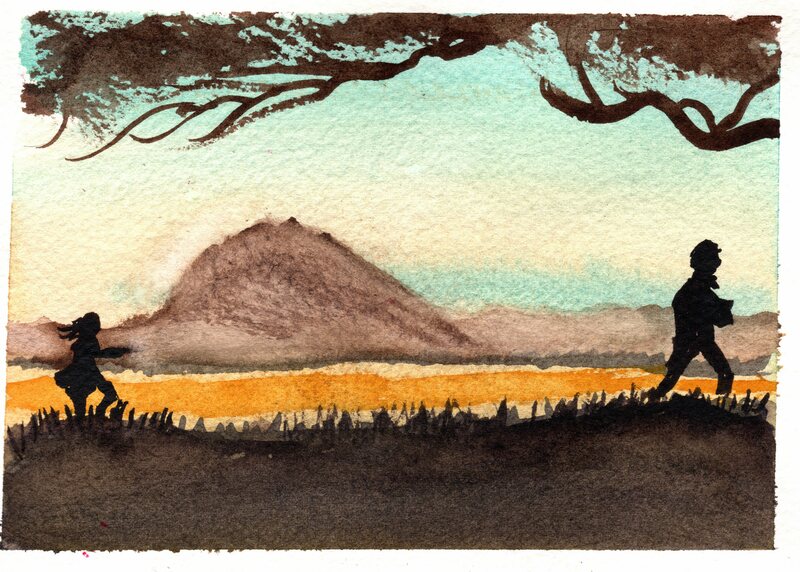 The cover of the book is so beautiful, I decided to try a quick watercolor of it, so this is today’s #WorldWatercolorMonth Painting. 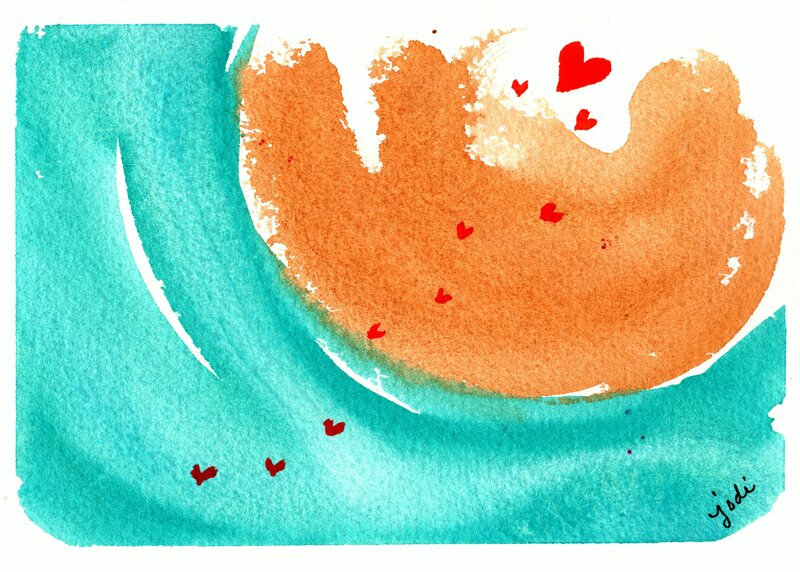 Today’s painting for #WorldWatercolorMonth is a simple abstract done with bold strokes of cobalt teal blue and raw sienna and embellished with some tiny hearts in cadmium red. A simple, yet bold expression of the power of love. 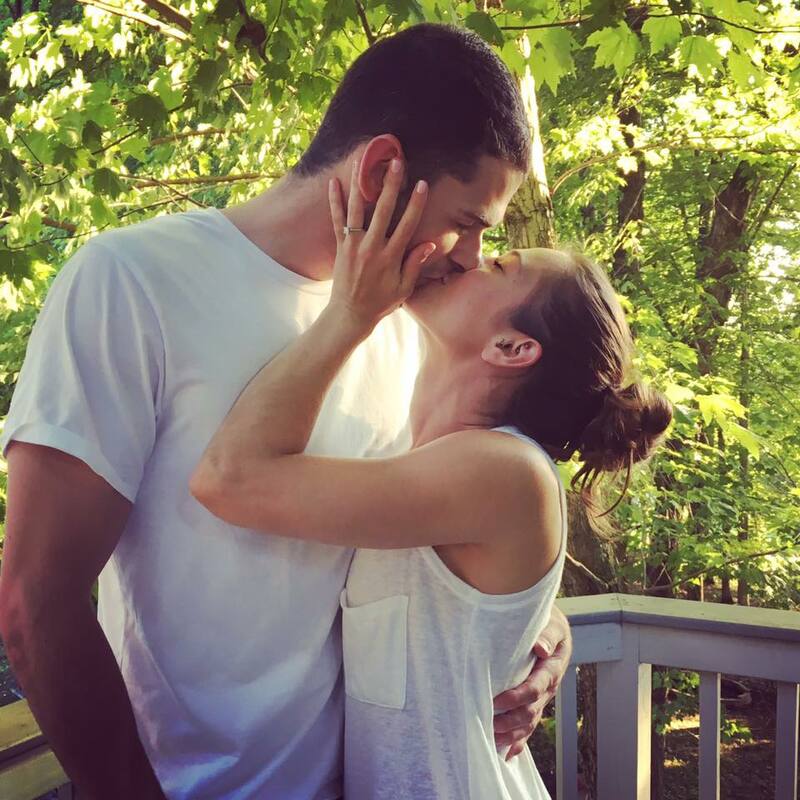 We are being blessed with another beautiful daughter-in-law! 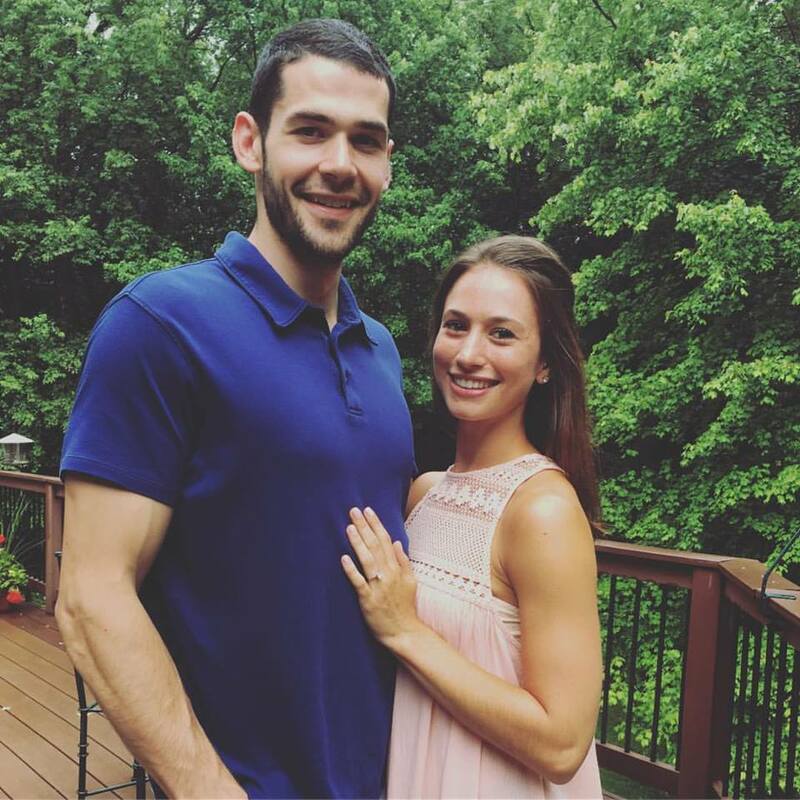 Our son, Nick, proposed to his beautiful fiance, Liz, this past weekend. 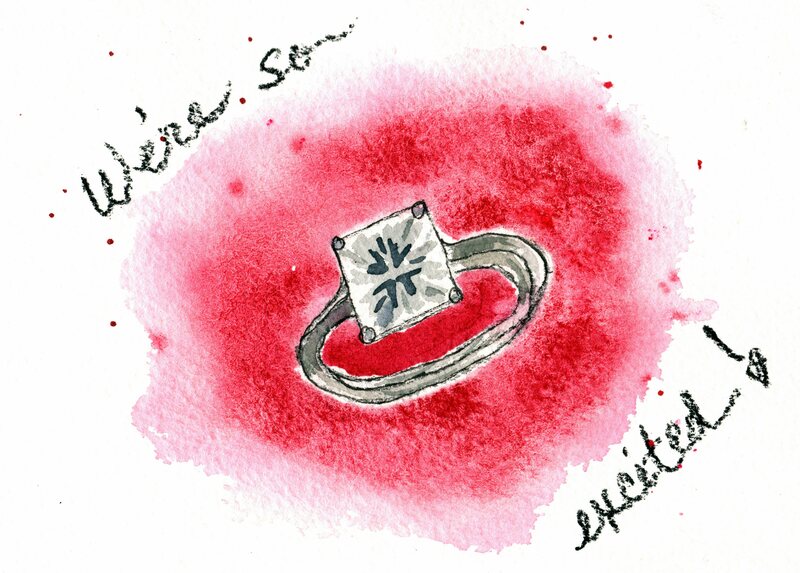 So today’s little painting for #WorldWatercolorMonth is a diamond engagement ring. or the joy in my heart. for a lifetime of love. 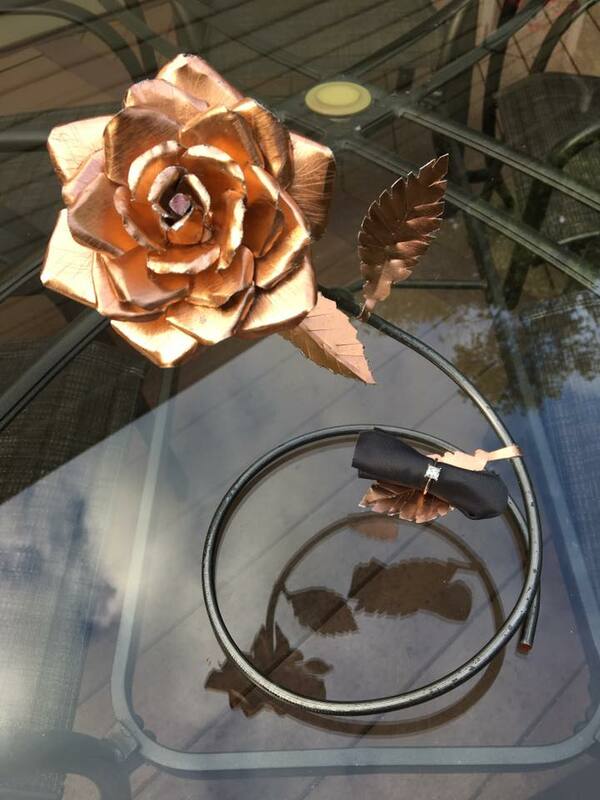 Nick created a beautiful “forever rose” from copper and metal as part of his engagement ring presentation. And we enjoyed celebrating the happy couple – the new #McKinneytoBe this weekend! 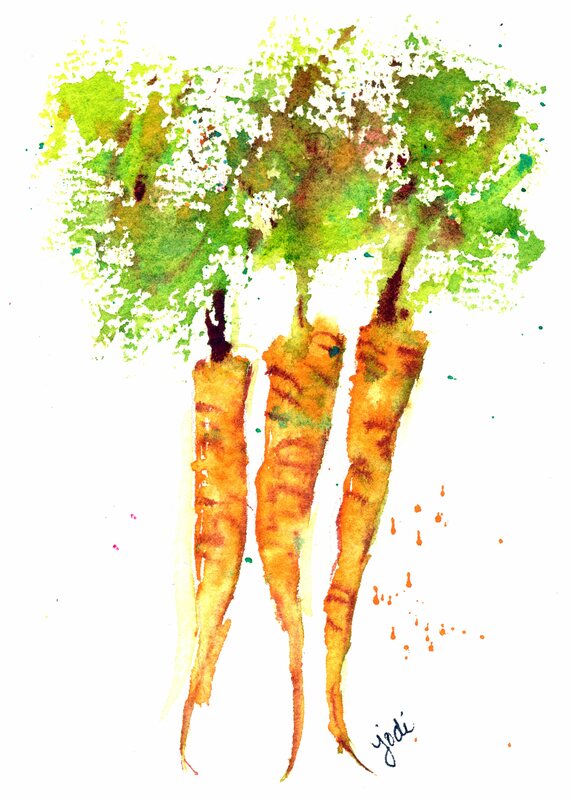 Today’s painting for #WorldWatercolorMonth is a quick and simple one celebrating the glorious carrot. It was fun to create the leafy greens by gently rubbing the side of a rigger brush across the rough watercolor paper in random strokes. Carrots are a beautiful, healthy vegetable that is equally delicious raw and cooked. For a yummy version of roasted carrots, check out my recipe for Roasted Caramelized Garlic Carrots here. 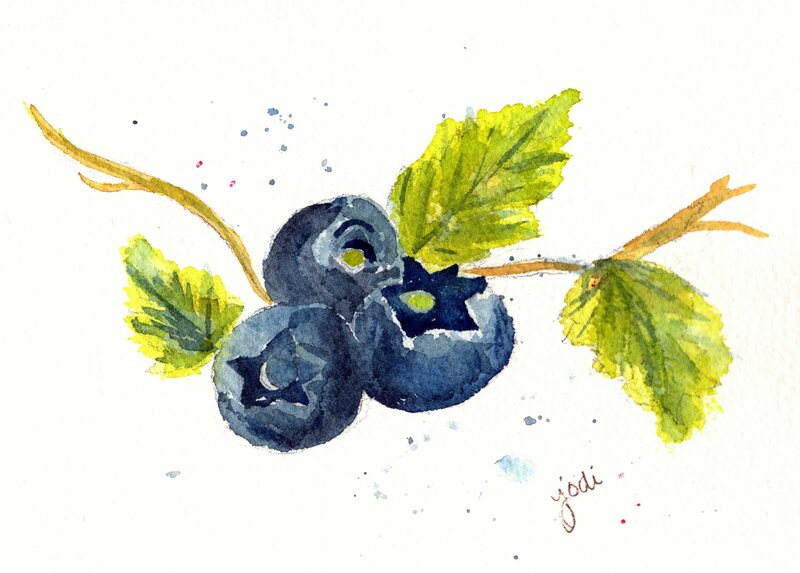 For today’s #WorldWatercolorMonth Painting, I present: Blueberries in Prussian Blue. 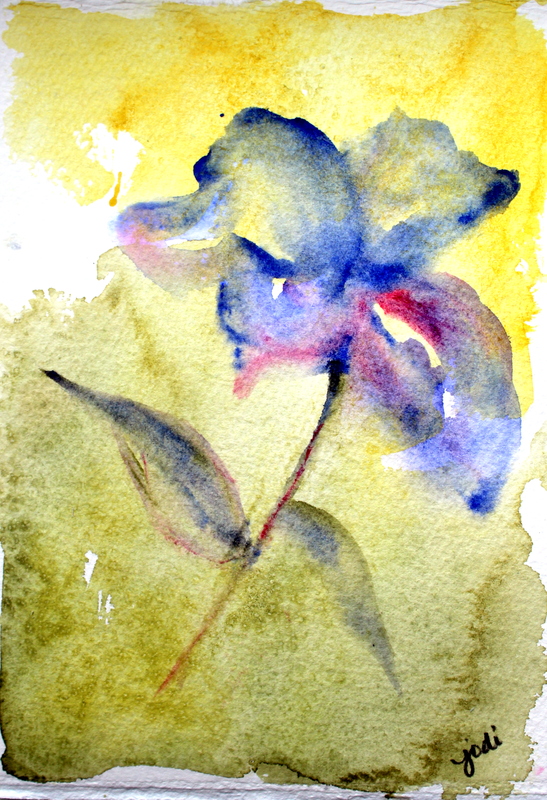 This is a “botanical” painting of sorts and possibly one of my more “realistic” paintings. A bit of a diversion for me. And while we are on the subject of blueberries – the yummy, nutrient-packed fruit of the gods, here is a recipe for a spinach salad I made last week with blueberries in it. DIVINE! 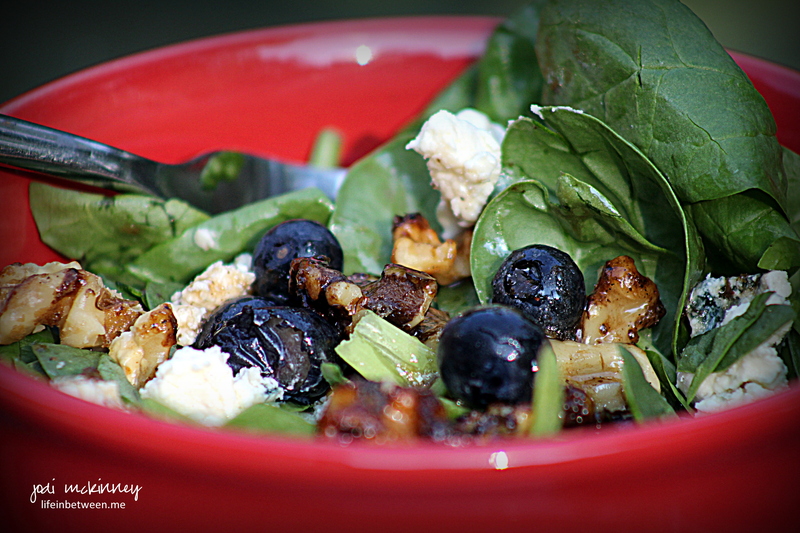 I tossed some fresh spinach with blueberries and blue cheese (but you could use feta or goat or any other cheese you like), toasted walnuts, and green onions, and then drizzled with balsamic vinaigrette for a really fresh, yummy salad. Some other favorite blueberry recipes I’ve shared in the past you might want to check out are my “almost famous” to-die-for Blueberry White Chocolate Chip Cookies and melt-in-your-mouth Fresh Peach and Blueberry Streusel Muffins. Maybe not quite as healthy, but very delish! 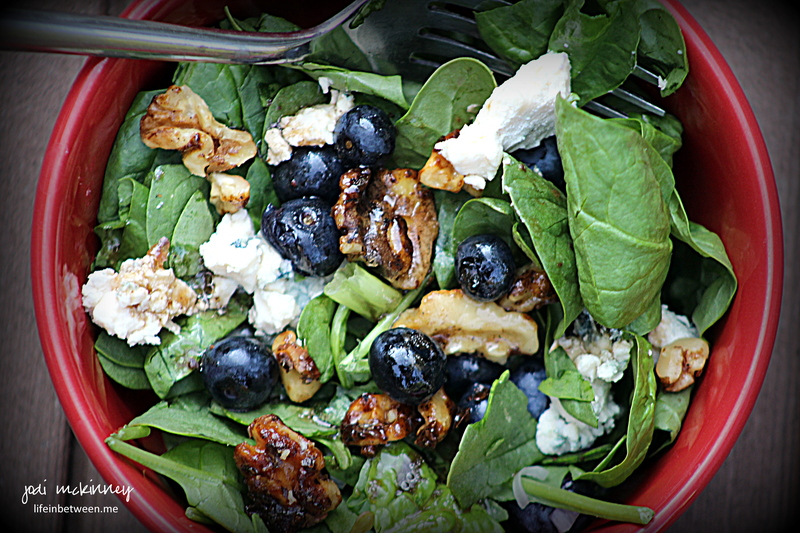 Combine fresh, clean spinach, blueberries, green onions and walnuts and drizzle with balsamic vinaigrette. Top with crumbled blue cheese and serve immediately. *Melt 1 Tbsp butter in skillet over medium heat. Add walnuts, and sprinkle with sugar. Saute over medium heat for approximately five minutes until sugar has melted and walnuts have browned. Cool completely. and letting it do it’s thing. a quick splatter or three. PS Thanks for the inspiration Laura!